The astounding news that three of the five industrial wind turbines in West Lincoln were constructed in violation of Provincial setback regulations has ignited a chorus of angry neighbours and the West Lincoln Glanbrook Wind Action Group to demand that the MOE cancel this FIT wind energy contract. Confirmation of the setback deficiencies finally came Monday February 3rd when Mr. Vic Schroter, Director of the MOE, Environmental Approvals Branch acknowledged to WLGWAG member Wendy Veldman that an Ontario Land Surveyor had verified that three of the five turbines are deficient in their property boundary setback requirements and subsequently in violation of their Renewable Energy Approval. The contentious West Lincoln wind project is in the final stage of completion and consists of five humongous turbines towering 475’ above this rural neighbourhood. If permitted to commence operation this spring the 729 residents living within a 2km radius of these 5 industrial wind turbines are fearful of the expected major negative impacts. As globally reported wherever industrial wind turbines have been erected as many as 15- 20% experience serious health impacts, 20-40% property devaluation (if even salable at all), and a serious devastation of the local bird and bat populations. The project is being constructed by Rankin Construction as a major partner in Vineland Power Inc. which received their Renewable Energy Approval on June 20, 2013 despite massive public protests and municipal Council objections dating back to 2010. Unfortunately, under the Green Energy Act, municipal governments were stripped of their historic and democratic rights to plan or regulate such industrial intrusions onto prime agricultural farmlands. 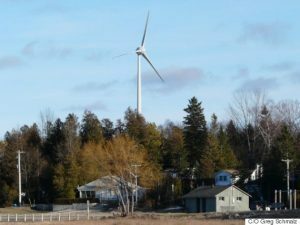 In response to the Green Energy Act, the West Lincoln Council in conjunction, with ninety one other rural municipalities, declared itself a “Not a Willing Host” to wind turbines. Additional Council petitioning the Province to impose a moratorium on any wind development until the federal Health Study on industrial wind turbines is completed in 2015. Similarly over 2000 local residents signed a wind moratorium petition which was submitted to the Provincial Legislature in April 2013 by local MPP Tim Hudak. While the MOE hasn’t shared the extent of the setback deficiencies, members of the WLGWAG took measurements with a laser rangefinder and found four setback infractions with the largest short a whopping 92’ or 29% deficient. Most frustrating for local law abiding residents is the obvious double standard that is applied to wind turbine projects. As any homeowner, businessman or developer knows if ever they make a construction error on their approved setback distance they’d be slapped with an immediate stop work order and a demand to demolish or move the project irregardless of the owners expense or loss. Unfortunately it appears a different law applies to the wind industry and they can do no wrong under the current government’s “carte blanche” endorsements. As of Friday, February 7, 2013 residents have now learned from Mr Steve Green, MOE Niagara Compliance Officer, that a new precedent will be set to legitimize the setback deficiencies by allowing the wind company to retroactively seek and acquire permission from the impacted neighbours to accept reduced turbine setback distances from their property boundaries. Interestingly, Sarah Raetsen (MOE) in an email to a WLGWAG member, clearly stated that if there was a need for a property assessment report it should have been completed PRIOR to the applicant’s final report submissions and MOE approval of the project. “Enough is enough”, says Neil Switzer. “It’s time for all concerned citizens to join us in our demand that this project be cancelled immediately. It’s time to restore justice and to curb the skyrocketing electricity costs resulting from these inefficient and exorbitantly expensive wind projects”. Neil urges all to call or send your demand for cancellation of this project to Mr Vic Schroter, Director, Environmental Approvals Branch, who is both acutely aware of this transgression and more importantly has the legislated right to revoke or cancel the project’s approval. Please also send a copy of your demand to Schroter’s superiors Minister Bradley and Premier Wynne. *Editor’s note: this is not correct. Health Canada does not expect to have results of its study until 2015. The Ontario Ministry of the Environment was created to protect the environment for wildlife and humans. However, the ministry is involved in approving green energy projects and is approving projects that are clearly detrimental to the environment, in particular the installation of industrial wind turbines across the Ontario countryside. Why is the Ministry of the Environment condoning the sprawl of industrial wind turbines across our countryside in clear disregard for rural dwellers and our wildlife? Because the Ontario government has mandated it to do so, in order to fast track and push through these unpopular and financially unviable projects that the McGuinty government created. Kathleen Wynne has said that she would re-think some portions of the Green Energy Act and specifically give back the authority of the Municipal Planning Act to municipalities that have declared themselves “unwilling hosts to industrial wind turbines”. In June 2013, the British government took action to create a law to ensure that all municipalities had proper planning authority with respect to wind energy development. Where is the commitment from our Ontario government? When will we get some action to back up the promises by Kathleen Wynne? Why has our government specified industrial wind turbine setback distance from dwellings only 550 metres, when most countries have a setback of 2,000 metres, recognizing the negative effects that wind turbines have on the living conditions of people? So, we should all be demanding action now, by writing to Premier Wynne. As we know, Dufferin County recently passed a Not A Willing Host motion. Here from today’s Brampton Guardian, a report and interviews. Dufferin Wind Power Inc. doesn’t expect that its wind farm will be up and running by its commercial start deadline on Jan. 30, 2014. Wind farm developers should look elsewhere than Dufferin, according to a motion passed by county council. 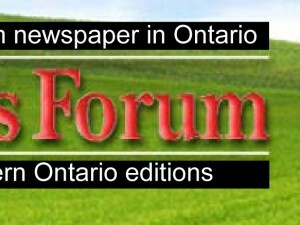 On Nov. 14, council approved a motion declaring Dufferin County as an unwilling host for any future industrial wind farm development. Although the Green Energy Act prohibits municipal councils from actually denying wind farms from setting up, Melancthon Mayor Bill Hill said the motion aims to dissuade such development. “It will send a message that Dufferin County is tired of the Green Energy Act,” Hill said, who moved the motion. Amaranth, Melancthon, Mulmur and Grand Valley have all approved similar motions announcing their request that wind farm developers find another home. Hill said more than 90 municipalities have approved similar motions. “We’re one of many. We may be the first county that’s done it and we don’t mind being leaders,” Hill said. Will the motion hold any weight at Queen’s Park? Wind turbine activists are fuming after vandals took target on one of their signs. Police are investigating the vandalism as the property owner’s property was also damaged in the incident. The WLGWAG formed in opposition to the first of two industrial wind turbine projects proposed for West Lincoln. The first project is in the final construction stages. Five, 80-metre turbine towers can be seen from Highway 20 in rural West Lincoln. Their blades will not spin until the new year, a company spokesperson previously told The News. The second project, proposed by Niagara Region Wind Corp., proposes 77, 135-metre wind turbines with 50-metre blades. Forty-four of those turbines will be built in West Lincoln, the remainder in bordering Wainfleet and Haldimand County. The sign has been repaired and moved to a new property on Westbrook Road. Comments are open on the story here. Manvers residents give Wynne a message: Not A Willing Host! From the Peterborough Examiner, a report on Premier Wynne’s reception at a Liberal insider event in the Peterborough area last evening. There were two groups of protesters present Thursday night. The wind farm protestors, about 100 in total, were by far the loudest, singing chants, blowing whistles and encouraging honks from passing motorists. About 30 No Casino Peterborough protesters also gathered outside. Wynne, who showed up an hour late, was ushered through the back door of the arena, but immediately came outside alongside Leal to meet the protestors, who had been gathered there for about 1 ½ hours. Spokesman Paul Reid, with Manvers Wind Concerns, said the protesters wanted to get across a clear message. Reid was the first protester to have a dialogue with Wynne as others shouted out questions and some heckled. “We haven’t even had a definition, premier, of what a willing host is. We’d love to have one of those because then we could prove to you that we’re not,” Reid said. “Some of the projects that are in the pipeline will go ahead. Some of them won’t depending on the approvals,” Wynne replied. She reiterated her government’s promise to give communities more say when it comes to the location of future wind projects. “So cancel existing projects,” a woman interrupted. “Well, you know what, it’s just not as straight forward as that,” Wynne said. Cavan Monaghan Township Deputy Mayor Scott McFadden was in the crowd. “It’s really important for everybody to come out and demonstrate that we’re not a willing host and we don’t want the industrial wind turbines out in our area,” he said. After talking to the increasingly hostile group of protesters for about five minutes, Wynne returned inside where she was greeted warmly by the 120 people in attendance. Bonnechere Twp is Not A Willing Host number 75! November 20, 2013—Over the past week, the County of Dufferin and Bonnechere Valley Township in Renfrew County declared their municipalities to be “Unwilling Hosts’, bringing the total number of ‘Unwilling Host’ municipalities to 75. Despite the growing opposition to wind turbine projects, the Provincial government continues to proceed with wind turbine projects in ‘Unwilling Host’ communities. An example is the Dufferin Wind project in Amaranth and Melancthon Townships in Dufferin County which previously declared themselves ‘Unwilling Hosts’. Dufferin County Council supported these lower tier municipalities by also passing a resolution asking the province not to extend the current January 14, 2014 deadline for completion of the Dufferin Wind project. The County also filed for a stay of activity for the Dufferin Wind project that is the subject of an Environmental Review Tribunal. Despite the appeal, the wind company is currently proceeding with construction work on the project. Municipalities are looking for real local planning authority for wind turbines to be returned to local governments. Municipalities are better placed than Queen’s Park civil servants to identify local issues that need to be addressed in reviewing wind turbine projects. They also have processes in place to review and approve other complex or controversial projects building projects that take occur within their jurisdiction. These municipalities are also looking for the government to follow up on the health complaints being filed with Medical Officers of Health and for the MOE to stop denying that there are problems with excess audible and low frequency noise and actually enforce their noise standards. The preliminary results from the University of Waterloo Health Study, commissioned by the Ontario government, show that there is a statistically significant relationship between health complaints and distance to turbines. This study just confirms what is reported to local municipalities from existing turbine projects in their communities or neighbouring communities. More comprehensive study of these health issues is warranted before any further projects is approved. As Mayor April Jeffs of Wainfleet states, ‘municipalities are looking for solutions to the real problems, not public relations gimmicks’. Kevin Marriott, Mayor of Enniskillen calls on the government to hold some real consultation with rural Ontario before they move forward with this program. This request applies both to the awarding of new FIT contracts but also to issuing Renewal Energy Approvals for projects with existing FIT contracts. The Coalition of ‘Unwilling Hosts’ grew out of a meeting of municipal officials held during this summer’s AMO conference in Ottawa. The current list of the 75 “Unwilling Host’ municipalities is attached with a map available at http://ontario-unwilling-hosts.org/ouh-d14.html. For further details contact April Jeffs at 905-658-7890, Kevin Marriott at 519-844-2307 or Warren Howard at 519-291-6950. Dufferin County declared the whole county an Unwilling Host at their meeting last week. Most of the lower tier municipalities within the County had already declared but this development adds Mono, Shelburne and Orangeville to the list of communities. For a map of Not A Willing Host communities please go to www.ontario-unwilling-hosts.org . Here from today’s Ottawa Citizen, the report on yesterday’s Ottawa City Council decision to acknowledge a petition by residents of the North Gower area, within the amalgamated city, to be Not A Willing Host to a proposed wind power project that would expose more than 1,000 homes to environmental noise and vibration. “The petition sends a strong message that politicians say is worth listening to,” says the Citizen.